An innocent retired military veteran was detained, handcuffed, and treated like a burglar because he was moving a TV while black. Fitting the description—in the land of the free—or, as the case below illustrates, simply being a man of color, can and will end with you being detained, harassed, kidnapped, or killed, even when you are entirely innocent. Karle Robinson recently found out the hard way what moving a TV into your new house looks like while being black in a police state. Robinson was moving into his new home last August and was resting his body on the top of his big-screen TV when a police car’s headlights lit up his driveway. Knowing he did absolutely nothing wrong, Robinson thought he’d talk to the cop and then be on his way. But that’s not what happened. Robinson told the Kansas City Star that he’s sure things would’ve gone much different if he weren’t black. Robinson was wrapping up a 12-hour long moving day and it was 2:30 in the morning. All he had left to do was move the TV inside and he could finally get some rest. Trusting that the cop would be empathetic to his situation, Robinson even asked him for help to get it inside. “I could use a hand with this,” Robinson said to the officer who shined a flashlight on him. But help was the last thing on this cop’s mind. Instead, this officer thought he’d landed him a genuine robber who apparently didn’t try to run or otherwise resist in any way. Instead of helping Robinson lift the TV, the officer handcuffed the innocent retired military veteran and forced him onto the ground all the while treating him like a burglar. “Is this all necessary?” Robinson asked the officer as he sat, cuffed, while backup officers arrived. The 61-year-old retired military veteran told his story to The Star Wednesday in his home as he watched body camera video from the first Tonganoxie police officer he encountered on August 19. The fact that the officer was curious, even a little suspicious, made sense to Robinson. The hour of day was odd. And Robinson was standing over a large TV in front of a house. But Robinson told the officer that he was a new homeowner, moving in. He had identification and there was paperwork proving his new ownership inside. They could go in together and look, and maybe hoist this TV inside on the way. The police officer’s voice came through on the body camera as Robinson watched. He watched himself wearily complying with the white police officer’s commands, submitting to handcuffs in front of the new home — his first as a homeowner — a city guy finally living out in the country as he’d dreamed of for so long. Then his arms were drawn down and back one at a time and the cuffs snapped closed. Robinson is convinced that he was treated as a criminal because of his skin color. Tonganoxie Police Chief Greg Lawson thinks the officer handled the situation just fine while protecting himself and Robinson. 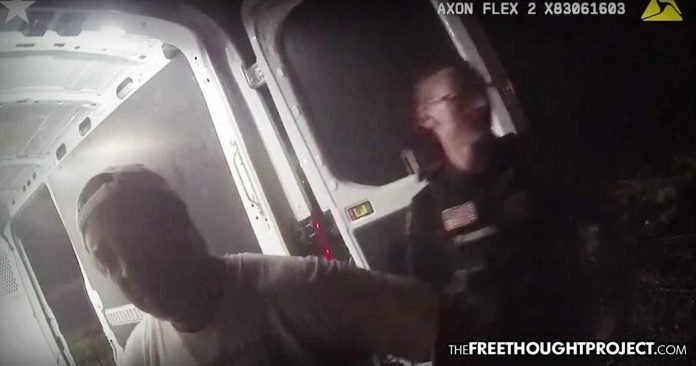 The chief says the handcuffs were so the officer could determine if Robinson’s story was true and helped to assure that the situation remained calm. “If I were on that call, by myself, no matter the race of the person, they would have been handcuffed,” he said. Apparently, police want citizens to be entirely okay with being detained and handcuffed—as in treated like a criminal—while they investigate whether or not you actually are one. That sounds an awful lot like being presumed guilty until proven innocent. “You’re guilty until proven innocent,“ Robinson said of being black. The officer claimed — as so many officers are heard claiming on video after video — that there had “been a lot of break-ins lately.” But Robinson disagrees. “That’s a lie,” Robinson said Wednesday. He talked with his new neighbors, he said. No one knew of any problems with break-ins, according to the Star. Robinson subsequently filed a complaint but explained that it went nowhere. He says Lawson told him that they would’ve treated anyone regardless of race the same way. But Robinson is not buying it. If he’d been white, Robinson said, he would have been able to show his identification and go and retrieve the papers to the house — all without such suspicion and without handcuffs.